EV charging times are falling and charging equipment is developing to provide faster, smarter charging, as Steve Banner discovers. 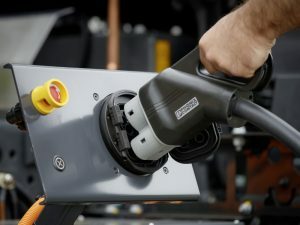 High-capacity batteries, such as the units in the new Daimler electric truck, will require higher-output charging. Perhaps best known in the West for its all‐electric buses, Chinese manufacturer BYD has a variety of other products in its armoury. Back in January it delivered 35 battery‐powered T3 vans to DHL International Air Express to help the operation handle deliveries in the central business district of the southern Chinese city of Shenzhen and the surrounding area. Looking a little like Nissan’s electric e‐ NV200 light commercial, T3 boasts a 3.5m3 load area and a payload capacity of up to 800kg. Fitted with BYD’s own ironphosphate batteries, it offers a range of over 200km says the company. In its own modest way the T3 should help clean up China’s chronic air pollution. Cities worldwide are attempting to do the same thing, with vehicles (often unfairly) viewed as major culprits, diesels increasingly in the firing line especially so far as NOx and particulates are concerned and zero‐emission electric models regularly put forward as the solution. Germany’s Fritz Kuhn certainly believes they have a key role to play. One of the founding members of the Green Party in former West Germany over a quarter of a century ago, he was an Alliance 90/Green member of the German parliament and is now the Alliance 90/Green Lord Mayor of Stuttgart. Sitting in a bowl with hills all around, the city can at times suffer from poor air quality. “Sustainable mobility is a key issue for cities, electric mobility is an important element of it and in Stuttgart we’re showing the way,” he states. He has instituted a policy of only acquiring electric cars for use by the city council’s various departments and has four battery‐powered light trucks on trial in conjunction with Daimler. They are all Fuso Canter E‐Cell 6.0‐tonners; Fuso is part of the Daimler family. Two of them are bodied as tippers and are being used by road repair crews and landscape gardeners. Fitted with box bodies, their stable‐mates are being used to transport everything from furniture to waste bins. The private sector in Stuttgart has electric power on its agenda too. A fifth E‐Cell is in service there with parcels carrier Hermes. Kuhn recognises however that battery‐powered vehicles cannot be viewed as truly emission‐free if the power they use comes from burning fossil fuels. “So we are ensuring that the energy provided by our re‐charging stations comes from renewable sources,” he states. Renewable sources and electric vehicles can enjoy a mutually‐beneficial relationship according to Martin Hale, responsible for global technology giant ABB’s UK and Ireland charging infrastructure. While wind turbines and solar power provide next to no energy when the wind does not blow and the sun does not shine, when both situations occur they suddenly deliver excessive amounts of power to the grid; more power than it knows what to do with. “As a consequence a lot of the energy being generated is wasted,” he says. That need not be the case, however. He points out if lots of EVs are plugged in being recharged because their batteries will be able to help absorb it and contribute to ironing out the peaks and troughs. A balanced smart grid is required to make this work really effectively. Alfen has been involved in the creation of one in Wageningen in the Netherlands in conjunction with partners GreenFlux and Enexis, which includes charging points. It has the ability to store excess electrical energy from renewables which can be released whenever required. Netherlandsbased Alfen supplies a variety of products used by electricity grids, from substations to charging points. Smart‐charging networks that rely on renewable energy to charge vehicles plugged in overnight from, say, 7.30pm to 7.30am can stop charging them for an hour or two – between midnight and 2.00am for instance – if the wind drops. They can then start charging them again when the wind picks up and the turbine blades begin to turn more quickly without leaving the battery depleted when the driver needs to get to work the following morning. If the driver needs to use the car in the evening, however, or make an early start then this arrangement can be over‐ridden, although in some circumstances there may be a charge for doing so. The charging point then can stay switched on all night relying on stored renewable energy or possibly energy from non‐renewable sources. Over‐riding may also be necessary if the wind does not start blowing again until the following afternoon. BYD makes the point that electric vehicles themselves can help balance the load on the grid by funnelling power into it from their batteries at times of peak demand. They can then have their batteries recharged during off‐peak hours. If the use of electrical vehicles increases – along with plug‐in hybrids they accounted for 24% of new registrations in Norway during the first quarter of this year – then presumably charging points will be required on every street corner. Improvements in battery capacity mean that this need not be the case. “Over the next year or so we’ll see cars coming onto the market with realistic ranges of up to 320km between recharges,” points out a senior executive at a major supplier of charging facilities. With deliveries scheduled to start in 2017, Tesla’s Model 3 for example should be able to travel for 350km before it needs plugging into a charging point. Longer ranges should mean that fewer interim charging points would be needed. Many drivers of EVs will be able to keep them topped up simply by using a charging point at home and one at work unless they are going on a very long journey. That of course pre‐supposes that they live in a house with off‐street parking as opposed to on the top floor of a block of flats and that their city centre workplace has parking space for electric vehicles. Only 30% of homes in the Netherlands have off‐street parking points out Alfen subsidiary ICU Charging Equipment. As a consequence publicly accessible urban/suburban charging points are likely to remain necessary but drivers may not need to leave their vehicles plugged into them for hours on end. That is because such points are increasingly likely to be fast charging. Having recently agreed to purchase solar energy specialist SolarCity, Tesla has been busy creating a network of fastcharging stations in North America, Europe, China, Japan and Australia. Each station should be able to provide one of its cars with a 270km range boost in as little as 30 minutes. The aim is to ensure they are strategically located so that Tesla drivers never run out of power before they reach one. Even 20 or 30 minutes may start to look irritatingly slow in the near future given the rate at which charging times ar falling. Charging point design is developing apace too with some manufacturers showing an impressive degree of initiative when it comes to designing facilities tailored to local circumstances. The acute shortage of land in Hong Kong has prompted BYD to develop a vertical charging carousel six stories high that can recharge a dozen electric cars – BYD e6 taxis in this case – simultaneously. It takes up much less room than giving them individual parking spaces on the ground. Equip the carousel with a 40kW charging box and it can charge 36 cars a day rising to 108 daily if a 100kW box is fitted. The entire structure is designed to resist the impact of severe earthquakes measuring up to 8 on the Richter scale says BYD. The near‐breakneck speed at which it should be possible to recharge batteries in the near future is illustrated by a project unfolding in Switzerland. In July ABB was awarded orders totalling more than US$16m/€14.4m by Transport Publics Genevois, Geneva’s public transport operator, and Swiss bus maker HESS. They are for flash‐charging and on‐board electric vehicle technology for 12 electric buses, which will run between Geneva’s airport and the city’s suburbs from 2018 onwards. Thirteen flash‐charging stations will be installed along the route, which will connect with the bus in under a second and give its batteries a 600‐kilowatt power boost over 15 seconds. A further four‐ to five‐minute charge at the terminus will replenish the batteries completely. “We’re proud of this breakthrough technology which support’s Geneva’s vision of providing silent and zero‐emission mass transportation for the city,” says ABB power grids division president, Claudio Facchin. Such environmentally friendly systems are likely to figure highly in the sort of minimal‐environmental‐impact mobility packages for employees increasingly being promoted by companies such as Alphabet. They include everything from the use of public transport to electric cars and car sharing. It will be interesting to see how easily smart‐charging systems based on vehicles being re‐charged overnight will adapt themselves to longer ranges and much shorter charging cycles; developments which will undoubtedly be welcomed by drivers. They might even consign range anxiety to the history books.